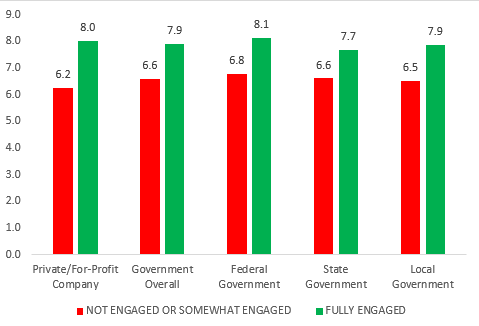 When I speak and write about employee engagement, I always emphasize that engagement matters because measuring and then improving engagement can improve organizational performance, including in government. In other words, employee engagement is not just another touch-feely HR scheme, nor is it about making sure that our employees are happy all the time. Instead, research and practice have shown that focusing on public sector employee engagement matters, including in government. When public sector employees are engaged, they are more likely to perform well, thus enabling government itself to perform well. As a result, the public will likely have greater confidence in, and support, government institutions. So, improving engagement is not just about making sure our employees are happy. Of course, we want our employees to be happy about their work and the organization, considering the alternative. At least most of the time, anyway. But when I discuss engagement with managers and supervisors, they often respond skeptically, saying that their job isn’t to make their employees happy. Instead, their job is make sure their organizations and work units perform, and deliver for the citizens their agencies and jurisdictions serve. I absolutely agree. And engagement is, first and foremost, about performance and service delivery. However, there is also a proven connection between employee engagement and employee well-being — and even employee happiness. 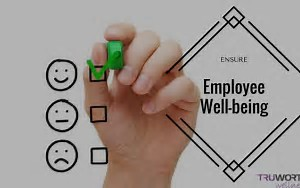 Other organizations which examine employee engagement have found a research-based connection between engagement and well-being. Research conducted by the Gallup organization, for example, has revealed that employee engagement and employee well-being are related. Gallup has also found that career well-being may be the single most important element of overall well-being – and career well-being is driven by the extent that employees are engaged. Research conducted by my organization, the Institute for Public Sector Employee Engagement, builds on this link between employee engagement and well-being. Our national poll found a positive relationship between engagement and employees’ perceptions of their well-being. Specifically, as figures 1 and 2 below show, our national survey revealed fully engaged employees in all sectors report significantly higher scores on overall life satisfaction and happiness, when compared to employees who are somewhat engaged or not engaged. 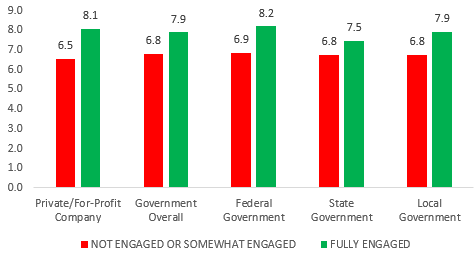 While these differences are not as stark in government as they are in the private sector, public sector employees who are highly engaged report a higher level of life satisfaction and happiness. This relationship between employee engagement and well-being/happiness matters because employees can perform better, and are more likely to stay with their organization, if they feel good about their lives overall. While no organization can ensure well-being in all aspects of an employee’s life, employers can improve engagement as a way to improve employee well-being. Our full report, “Driving Employee Engagement: Results from a National Study,” summarizes the level of engagement across the private and public sectors, including by level of government. The report also includes our analysis of the key factors that drive employee engagement nationally, also by sector and level of government. For a complimentary copy of the report, please contact me directly.